CAP Regulation 39-1 doesn't allow for much room with respect to distinctive unit uniforms. What's more, it also doesn't allow for specialty clothing based upon climate and terrain for operational missions. In these cases it is always advisable to use your best judgement. There has been much ado lately regarding orange t-shirts and the battle dress (camoflage type) utility uniform. While the uniform manual does not allow for orange shirts to be authorized at any echelon with BDUs, it can be an athletic uniform. The Golden Triange Composite Squadron of Columbus, Mississippi, has undertaken the project of Orange jersey-type t-shirts. The shirts have a small unit logo on the front and a one-of-a-kind number on the back. This gives each member an individual number as well as a sense of team unity. They are worn during physical training/testing meetings and during "civilian clothes" nights. New members can buy a shirt on their first or second visit and then have something to help them "belong" right from the get-go. While our guidance does not allow us to wear orange shirts with BDUs, we all know it happens. We probable even know in which CAP Wings it happens. Furthermore, we know that commanders occaisionall overstep their bounds and verbally authorize items that they cannot, by regulation, authorize. This is because the uniform board must approve anything that is not in the current manual. When faced with operational adversity however, always use your best judgement! 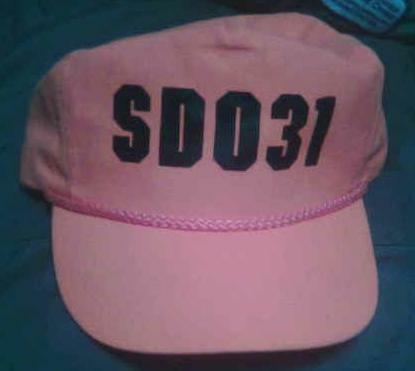 CAPM 39-1 DOES allow a squadron commander to authorize the a baseball cap for use with utility uniforms. CAPM 39-1, 1 Jul 97, p58, para 3-8(d) and 3-9(d) state: "Color, unit designation, and cloth or silk screen organization emblem or badge are prescribed by the unit commander." Table 2-2 on page 43 clarifies, "CAP Baseball Cap: Color, unit designation and cloth or silk screen organization emblem or badge as prescribed by the unit commander. Emblem or badge, if authorized will be centered 1/2 inch above visor. No other features such as stars, designs, individual's name and so forth, are authorized." It is therefore recommended to have a brightly colored unit hat. Bright orange is an outstanding choice, whether it be called hunter, safety, international, or neon. Yellow or red can also be good choices. Many units choose to have the last 3 numbers of their charter number affixed to the hats. This identifies one particular squadron from all the others during operations. This can come in handy during accountability checks if several units have adopted the same color hats. Other squadrons obviously elect to have their unit patch sewn on the hat. In short, we can still play by the rules and be distinctive and visible. A reminder that an orange vest is required when wearding the BDU uniform in a wooded area. This is for a multitude of reasons. First, it was a concession to the uniform board to get them to approve BDUs in the early 90s. Second, it allows you to see more of your team members and can even help an aircrew spot a ground team. Lastly, it will hopefully deter hunters from mistaking ground personnel as live game. Most states have some sort of hunting in progress year-around, so beware.